August 31, 2010 - The Aero Club of Southern California will honor Frederick W. (Fred) Smith, chairman, president and CEO of FedEx Corporation with its 2010 Howard Hughes Memorial Award. The Howard Hughes Memorial Award is an aviation industry award presented annually by the Aero Club of Southern California. The award is given "to an aerospace leader whose accomplishments over a long career have contributed significantly to the advancement of aviation or space technology." The award was established in 1978 by William R. Lummis, a first cousin of aviation pioneer Howard Hughes, who at the time was Chairman of the Board and Chief Executive Officer of Summa Corp.. Recipients of the Howard Hughes Memorial Award receive a solid silver medallion cast from silver mined from Hughes' Nevada mining operations. ?He joins an exclusive roster of aviation and space pioneers like Jack Northrop, Jimmy Doolittle, Simon Ramo, Neil Armstrong, Bob Hoover and Chuck Yeager.? The annual award, to be presented at a banquet at the Jonathan Club, Los Angeles on March 1, 2011 recognizes leaders who have made significant contributions to the advancement of aviation and space technology. "After an extensive review by the award committee, which includes 14 past honorees, we concluded that Fred Smith best represents sustained aviation excellence," said Aero Club president Nissen Davis. "He joins an exclusive roster of aviation and space pioneers like Jack Northrop, Jimmy Doolittle, Simon Ramo, Neil Armstrong, Bob Hoover and Chuck Yeager." Smith will be the 32nd recipient of the Hughes Award. Born in 1944 in Marks, Mississippi, Smith attended Yale University, where he earned a B.A. in 1966, served as an officer in the U.S. Marine Corps from 1966 to 1970. Smith heads a $35-billion global transportation, business services and logistics company. He is responsible for providing strategic direction for all FedEx Corporation operating companies, including FedEx Services, FedEx Express, FedEx Ground and FedEx Freight. FedEx serves more than 220 countries and territories with operations that include 664 aircraft and over 80,000 vehicles. More than 280,000 team members worldwide handle more than 8 million shipments each business day. The acquisition of two California companies ? cargo giant Flying Tiger Line in 1989 and Kinko?s office services in 2004 ? 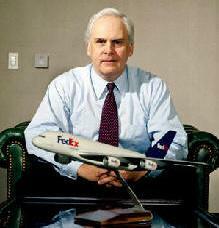 helped fuel FedEx?s dramatic growth. Since founding FedEx in 1971, Smith has been an active proponent of regulatory reform, free trade and "open skies agreements" for aviation around the world. Most recently, he has advocated for vehicle energy-efficiency standards and a national energy policy. A commemorative sculpture bearing Smith?s name will remain on permanent display at the Los Angeles International Airport's Flight Path Museum. During the banquet, ACSC will present him with a rare, solid silver medallion featuring Howard Hughes' image as well as depictions of his many accomplishments. The Aero Club was founded in 1925 ?to increases public awareness of the uses of aviation in the United States and around the world.? Today it supports scholarship and speaker programs, and is dedicated to the advancement of aviation and aerospace and to honoring their outstanding contributors. Among the Club?s accomplishments is saving the famed Hughes HK-1 Flying Boat, aka the Spruce Goose, now the centerpiece of the Evergreen Aviation Museum in McMinnville, Ore.